"A magnificent tapestry...Sanchez forges a new world vision...rich in the cultural and literary intertextuality of Steinbeck and Cervantes." "A holy terror of a book...[it has] immense power and passion...half mystery, half panegyric and wholly one of a kind, MILE ZERO is [a] fascinating novel about the end of the American road and the beginnings of a new world." "A mythmaking and magisterial novel." "A great novel of America...unforgettable." "Lush, tropical, feverish...cultures explode in MILE ZERO...Sanchez's fictional Key West acts as a narcotic propelling the characters into a bizarre American dreamland, turning them into human firecrackers." "An epic of Americana for the 60s generation come of age, grand and encompassing...the scope is tremendous...the language, nothing short of stunning...This is great stuff." "A fully realized portrait of America on the other side of Vietnam...MILE ZERO is a brave, smart novel with huge swatches of color and ironic vision that belongs to Thomas Sanchez alone." "Hypnotic...world-class literature, bends the mind as only great literature can...a brilliant, brooding lyric epic." "Packed with stories, crowded with characters, lush with language--a Gothic mystery gone contemporary and cosmic...rich and overwhelming in its abundance." "MILE ZERO reads as if it was written in the author's own blood, carved on his soul, plucked from a mind on the brink...it is what the Great American Novel was supposed to be about: the great American experience." 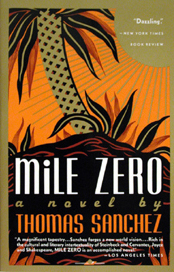 "With all of its crank, madmen and saints, MILE ZERO becomes, in its mythical accounts of tenderness and brutality, a great American novel." "Part thriller, part romance, part phantasmagoria...a dense, tropical nightmare of bright sunshine and dark images that stay with you long after its strange finale." "A psychic travelogue, a brilliant, breathless ride into the dark heart of a perfect metaphor." "A major literary event from a writer of enormous gifts...MILE ZERO is a novel of exquisite sorrow...and terrible beauty." "The only safe thing to say about MILE ZERO is that it is unique. Its tornado-like blend of history, myth, and fable are sure to draw comparisons to Gabriel García Márquez...Sanchez is a linguistic juggler." "Sanchez is interested in nothing less than encapsulating the entire 60s and all the passionate turmoil that era symbolizes." "Exciting...a whale of a story...vivid and exotic."